Having been refused planning permission by Bolton Council for the 300-dwelling development on land to the north of Platt Lane, developers Persimmon/Peel Holdings, not unexpectedly but disappointingly in light of the local concerns and evident problems with any development at Lee Hall, launched an appeal late November (27/11/16) - Appeal Notice (November). This means that the October 2015 planning application refusal would be scrutinised by the Planning Inspectorate, the decision to overturn the earlier decision decided by a Planning Inspector following a Public Enquiry. This has been further delayed from late April. The Planning Appeal was resumed after postponement to assess traffic impact, taking place over 4 days from 26 June 2017 at Bolton Town Hall. Both Council and Developer presenting their cases, backed up by evidence provided. Council - traffic impact on Chequerbent and Westhoughton generally, and loss of space for vital new road; Developer - houses needed as 5-year 'Local Plan' target not being met. Planning Inspector, Ruth Stockley, to consider the evidence and give her decision (expected 9 November 2017). Bolton News report (29/6/17). Documentation for the 2015 planning application can be found here (Ref: 94696/15). Submission of Statement of Common Ground - before 7 June (factual information not in dispute, thus not in need of consideration by the Inspector); Submission of Proofs of Evidence - 7 June; Witness names and anticipated duration for 'Opening and Closing Statements', 'Evidence in Chief' and 'Cross Examination of Other Parties' Witnesses' - 14 June. The deadline for written comments from interested parties was 25 January (2016); however, a copy of any representations received by the Council at application stage have been passed on and will be on file for the Inspector's consideration. The public are welcome to attend the inquiry where they can request the opportunity to speak or submit further written representations at the discretion of the Inspector. The issue of the further loading of Chequerbent roundabout is the main problem facing planners. Further traffic studies have been undertaken by consultants, and also by local residents. Lee Hall has been included for development in draft plans for the Greater Manchester Spatial Framework. 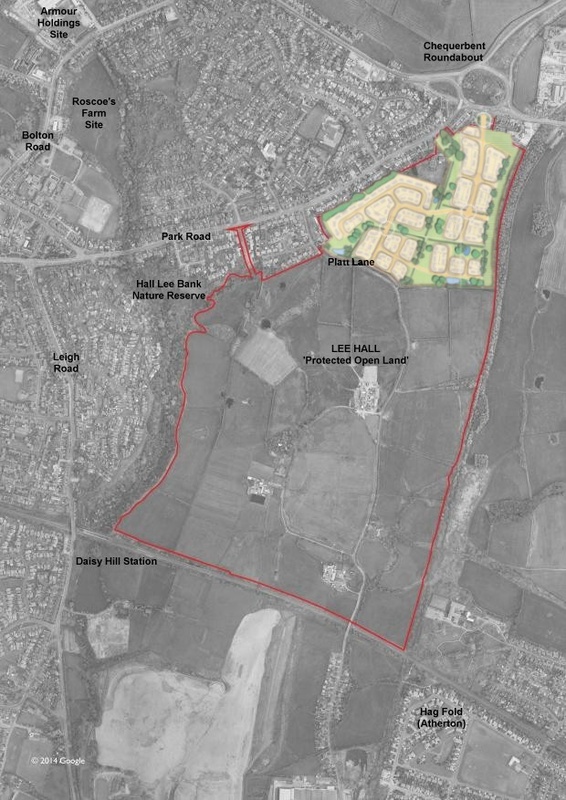 Some 27 months after the application to build 300-dwellings on Protected Open Land at Lee Hall, after a protracted and delayed Planning Enquiry the Planning Inspector has overturned Bolton Council's refusal and has decided to allow this development. The concerns over traffic onto Chequerbent Roundabout and Park Road not a sufficient reason to refuse - modelling indicating only marginal extra inconvenience for commuters. Shortfalls in Authority housing allocation targets of the now revoked Local Plan, and the wider allocation of Lee Hall for future development with improved road infrastructure in the Greater Manchester Spatial Framework (currently being redrafted), made a compelling case for approval of this development. DECISION. Planning Inspectorate Actions / Schedule - Timetable. Statement from Bolton Council - Council Case. Statement from Developer - Developer Case. Common Ground Statement from Developer - Common Ground (Developer). Developer Appeal Original Submission - Appeal. Public Enquiry Notice - updated (Planning Inspectorate) - Public Enquiry (up to 4 days allocated). Planning Inspectorate Appeal Documents & Representations - Lee Hall Appeal. Decision to APPROVE (19/12/17) - Planning Inspector Decision/Report. Further information and reading related to Lee Hall content. Lee Hall Planning Application Bolton Council - 94696/15 (29/7/15). Officer's Report for Planning Committee (22/10/15). S.W.A.N. Position - Points Against. Planning Inspectorate Lee Hall Appeal (5/7/16). Allocations Plan - Bolton Council's Local Plan site allocations. Adopted December 2015.